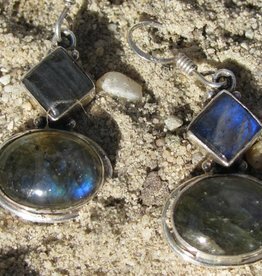 10 cm long not counting the ear hook Long and with a hand faceted labradorite stone. Material is silver with an electroplated gold layer. The stone is squarish and measures about 1.50cm accross. These earrings are made in a workshop in Sitapura ( just outside Jaipur ) with really fine working conditions. Very nice silver stud oorbel with a rainbow moonstone , tear drop shape facet cut.. Plain silver setting. 1 cm.